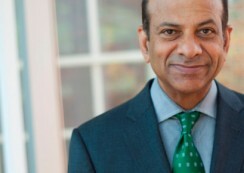 Vijay Govindarajan is widely regarded as one of the world’s leading experts on strategy and innovation. He is the Coxe Distinguished Professor at the Tuck School of Business at Dartmouth College, a new Dartmouth-wide faculty chair. He was the first Professor in Residence and Chief Innovation Consultant at General Electric. He worked with GE’s CEO Jeff Immelt to write “How GE is Disrupting Itself”, the Harvard Business Review (HBR) article that pioneered the concept of reverse innovation – any innovation that is adopted first in the developing world. HBR picked reverse innovation as one of the Great Moments in Management in the Last Century. In the latest Thinkers 50 Rankings, Govindarajan is rated the #1 Indian Management Thinker. 1 Tell us about yourself, your profession, and how you came to be a member of the RVC? VG: I was born and brought up in a small town in India. I come from a lower middle class family; we knew that the only way out was education. That’s all that mattered to my parents. I still remember everyday my father would ask me when I came home, “Did you get 100 in your math test today?” And if I didn’t, I was in trouble. In fact, not only I was not encouraged to play sports or do exercise but was discouraged because that was time taken away from studies. I came into this country when I was 25. While I never did formal exercise, or any sports in India, I was nevertheless healthy. You don’t have to go to a gym to be healthy in some sense. When I look back, there were three things that contributed to my health. One is my school was 1.5 miles from home and we had to walk to school. Our family didn’t have a car. Because we were not allowed to eat in restaurants, we had to walk back for lunch. So every day I walked 6 miles. Second, up until 25 years when I came here, I had not eaten in a restaurant. And that means always home cooked meals. My parents didn’t believe in storing food, we didn’t have a refrigerator. So every meal was prepared fresh. I ate very healthy. The third is stress. Stress comes from the choices we have. If you give someone 100 shirts from which he has to choose, he is stressed: which shirt should I buy? If it was only one shirt, you wouldn’t have to worry about it. When I came to this country, I went to the cafeteria and asked for toast. They said “What kind of bread do you want?” “There’s choice in bread?” I wondered. When you don’t have choices, that actually reduces stress, strange as it may seem. Low stress, healthy eating and long walks are what kept me healthy in India. In the first 25 years in the US, I became unhealthy. I forgot those three pieces which were promoting my health in India. First of all, I ate out at restaurants. Food in the US is rich, very rich. Second, there was no exercise. I wasn’t used to going to the gym. It was a very sedentary lifestyle in this country. Stress level was much higher coming to this country. So many adjustments you have to make. I had a limited exposure to everything, so when I came into this country, I felt like I had landed on Mars. Language was a problem, culture was a problem, studies were tougher, being on my own after 25 years of living with my parents. All of it created stress. I think the first 25 years was fine, but the next 25 was not. When I reached 50 years, I knew I had to do something because the body is the most important thing. If you forget that, nothing else matters. I had never done exercise in my life, but I am intelligent enough to realize the benefits of it. That’s what drew me into RVC. My wife joined RVC first, and then she recommended it to me. I think I initially told myself I was too busy to do it, but you’re never too busy, you can always find the time. 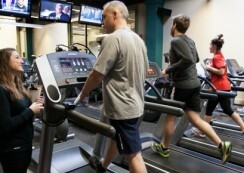 2 What are the top three reasons you incorporate fitness and personal training into your busy lifestyle? VG: The first is, I am really passionate about my work. I teach, I do a lot of writing, I work with a lot of companies. And I know one thing: it is possible to continue my professional work only if I am healthy. What I found initially when I came to RVC, I noticed my energy level was higher after the exercise than before the exercise. I am now 65 years old and have been coming to RVC for 15 years. I feel more energetic today than at age 50. So I said, if this is going to give me high energy, that’s what I need. So my first reason is really professional. I will not be effective as a teacher, scholar, and consultant without good health. The second is happiness. When you’re healthy, you’re happy. Even if exercise gives me one day of happiness, it’s worth it for me. The third reason is in India, we grew up with the philosophy that kids will take care of parents. My parents took care of my grandparents. That’s the concept. But that is not the concept in this country. I have two wonderful daughters and we are a close family. Yet, I do not expect my girls to take care of me later in life. And I certainly don’t want to be a burden. So if I’m healthy, I won’t be a burden to them, to my wife or to society. 3 What keeps you motivated to train five days per week, and what recommendations do you have for others about adopting this kind of schedule? VG: I train seven days a week. It’s interesting, even if I travel somewhere, if I have a meeting at 6:00am, I wake up at 4:00am to work out. It’s like brushing your teeth. You just do it. The reason is, if you want to be successful in the future, it’s not about what you have to do in the future; it’s about what you have to do every day. The future is about what you do today. Everyday your body decays. It may not be noticeable or visible. Through work, bad food, you tax it more. Everyday my body is decaying, I know that. I need to do exercise every day to stop that decay, maybe even keep it on a higher trajectory. If I’m in Hanover, I work out with Chris Poljacek at RVC. If I’m not here, I go to the hotel gym. I’ve worked out a routine by which I enjoy it. It gives me time to think, it gives me more energy. Why not invest in that? I do it every day because I know the exercise I do now has something to do with my health five years from now, ten years from now. Once I internalized that idea, I didn’t question it. 4 I know our readers are thinking this, VG. 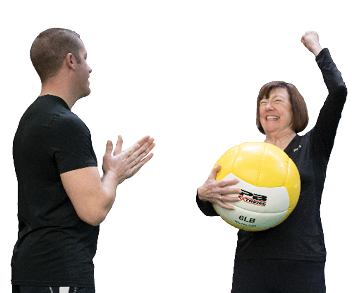 After 15 years of personal training with Chris Poljacik, why do you still need to work with a personal trainer? VG: Some relationships you don’t want to change. When you work with the same person, they really know your body. They know who you are and what would really make you happy. For example, the last couple of days I’ve been having a little extra problem in my back. So Chris says, let’s do this massage, and not do that exercise, etc. Because you’re working with one person, they really understand what your needs are. That’s important to me. That doesn’t mean they give the same exercise to you. They can change and vary the exercise routine so you have variety. And Chris has given me several programs I can do when I’m traveling. So, one important benefit is, he understands me. The second is social. Chris is more than just a trainer. There’s a social relationship that we’ve built. He’s a friend. It makes you want to come here. You enjoy coming here because it’s not just exercise, it’s a total relationship. The third is accountability. I am accountable to myself, of course, which is the most important person I’m accountable to. But working with Chris gives that extra pressure. I feel accountable to Chris. If I have an appointment with him, I make sure I show up. I consider RVC not as a cost, but as an investment. My degree at Harvard wasn’t a cost, it was an investment. RVC too is an investment with huge returns. 5 As one of the world’s top business innovation strategists, how do you see fitness and personal training integrating with healthcare in the future? VG: This is very important issue. In fact, it would be very interesting if someone studied the health of the Upper Valley before and after the RVC came. I think there would be a significant improvement in the health of the Upper Valley. The healthcare industry in the US is on an unsustainable path. We’re spending almost 20% of our GDP on healthcare. We can’t continue on this path. I would not even call it healthcare, it is a sick-care industry. We treat people who have become sick, we don’t make them healthy. Fitness is making people healthy. Of course treatment is still needed, but we are not paying enough attention to keeping people healthy. To me, therefore, RVC is important because It’s really promoting health. Look at the contribution RVC has made to the Upper Valley. There are direct benefits. It has created jobs for over 100 people. Everyone of its members have become more healthy. But there are indirect benefits as well. If I have more productive years as a result of working with Chris at RVC, I can in turn teach more MBA students at Tuck, each of whom would make a positive contribution to society. If you add up the direct and indirect benefits of RVC, it would run into billions of dollars. That is the kind of difference RVC has made. Personal training is very important because without that, I would be doing something without realizing how it really affects my body. For instance, I don’t know what to do with all the machines in a gym, so I would do something that doesn’t produce the optimal results. There are reasons why there are specialists in every profession. For instance, I can cut my own hair, too, but the reason I go to a salon is because it looks better. So it’s the same for me: I am in a profession, I am a teacher and I believe I’m adding value in a classroom, just like a trainer adds value for me on the fitness floor.